Homebuyers looking for a condo in Mississauga are often drawn to the Chicago condos – one of the recently completed Daniels buildings in Mississauga. Located in the Mississauga Square One area, this striking tower was designed and built by The Daniels Corporation, with the help of Kirkor Architects. Featuring classic “Chicago school” architecture with striking art deco details, the complex contains a single 36 storey tower which is augmented by an elaborate 6 storey podium, plus an adjacent group of condominium townhomes. 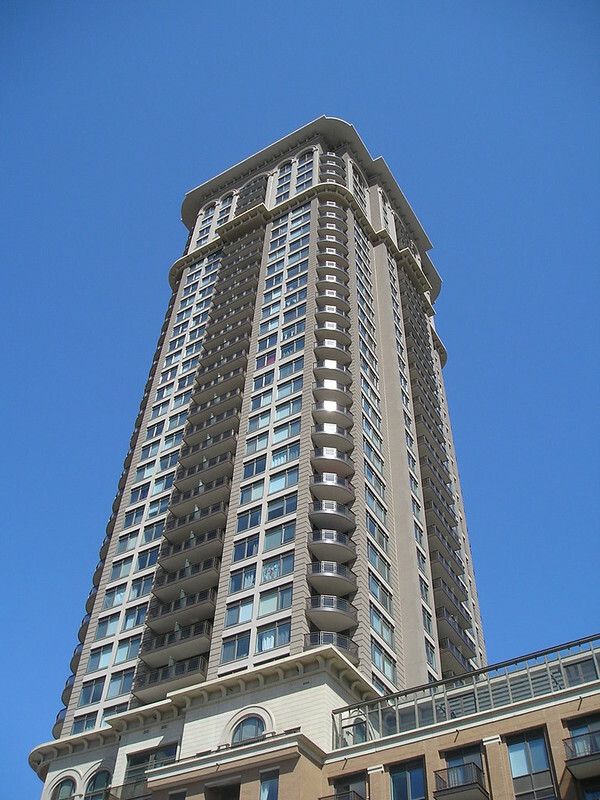 Municipal address for the Chicago condo highrise tower is 385 Prince of Wales Drive, and for the townhouses is 383 Prince of Wales Drive. 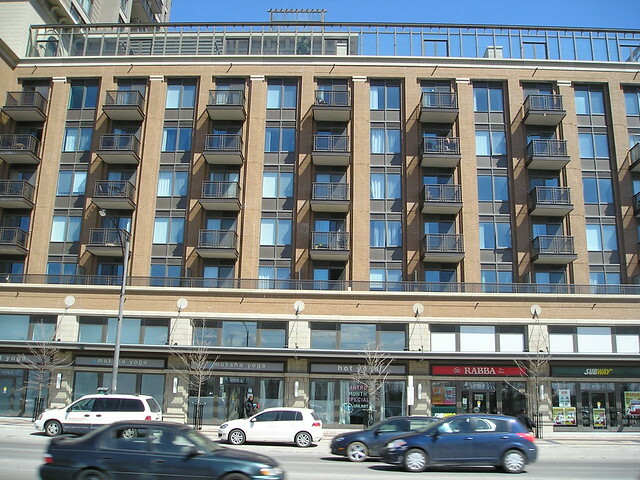 The Chicago condos are part of the Daniels’ master-planned community at Mississauga City Centre (MCC), and as such, are conveniently close to all that MCC has to offer: Square One Shopping mall is about a 2 minute walk away, with the entrance to the newly opened Target store closest. In addition, Celebration Square, Mississauga City Hall, the central YMCA, the central library, Sheridan College, the Living Arts Centre, and the Mississauga Transit and GO bus terminal are all within easy walking distance. Adding to the attractiveness of its “downtown Mississauga” location are easy to access to the 403 highway, and convenient shopping at the Rabba supermarket, located downstairs in the podium. Additional retail outlets open in the podium area include a real estate office, and a yoga studio. One of the Chicago condo’s strongest features are its amenities. Managed under the name of “Club 365”, Chicago features a unique residents-only 30 ft. climbing wall, an indoor pool, indoor and outdoor hot tubs, exercise room, gym, squash/raquetball courts, and sauna. There is also an elaborate outdoor facility on the roof of the podium, with BBQ areas, outdoor kitchen area, fireplace, and sundeck. Chicago also features a home theatre room, and a virtual media and game lounge. In keeping with the classic theme of the complex, there is a beautifully landscaped courtyard, with seating areas, walking paths, water feature, and children’s play area. Individual suites feature spacious balconies, and engineered hardwood flooring in the hallway, living/dining rooms, kitchen, and den. Bedrooms feature textured carpeting. Kitchens feature granite countertops, stainless steel appliances, and imported porcelain backsplashes. Chicago condos have added a noteworthy presence to the array of Mississauga condos near Square One, with a great offering of luxury features and amenities for those fortunate enough to live there. Chicago has also enjoyed buoyant rental activity over the past year. 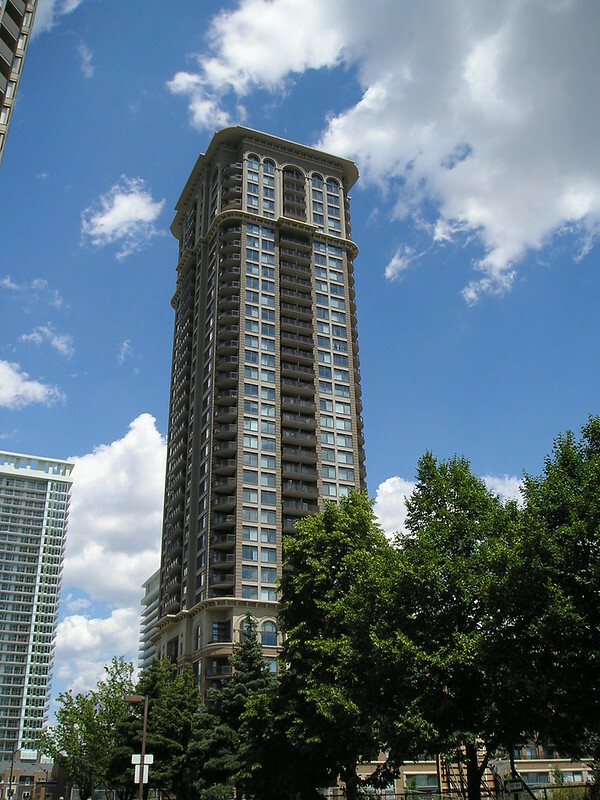 A strong brand “Chicago” affiliated with attractive architecture and amenities, have combined with its excellent central location in the centre of Mississauga, with close proximity to city transit, resulting in steady rental absorption, and increasing prices.